We were shooting in Miami for a global ice cream campaign created by JWT, New York. Originally, we hoped to shoot in LA after the last shoot but with recent rains the lakes dropped to 52 degrees. We ended up re-locating to Miami to shoot in slightly warmer waters. 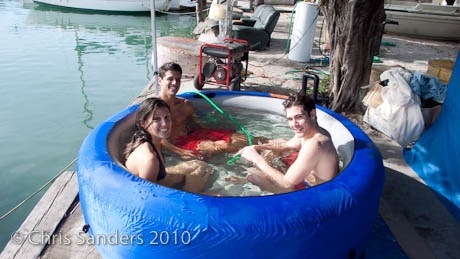 You’ll notice the hot tub we brought in to keep the models warm. I kept thinking I should have cast Canadians (with a spray tan). They would have thought it was warm. This was a combination of stills and video, including some water video footage shot with a 5D in a housing.